Pupils and staff at Blackthorns Community Primary in Lindfield are pictured celebrating after receiving an ‘outstanding’ rating from Ofsted. The school in Blackthorns Close was rated outstanding in all five key areas after an inspection from education bosses on September 18–19. Principal Marianne Brand said it was a ‘wonderful and well-deserved acknowledgement for the whole school community’. She added: “Our pupils, staff, local board members, parents and carers have worked together with passion and dedication to make this result possible. It has been an honour to lead the academy on this journey to outstanding. 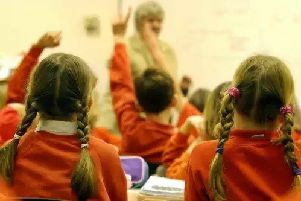 The Ofsted rating places the school in the top 19 per cent of UK primary schools rated ‘outstanding’, a spokesman for the school said. They added that this was a big boost for the school as it had shown great improvement from its ‘good’ rating in March this year. The Ofsted report says pupils thrive at the school because their needs are met extremely well. It also says pupils live up to adults’ very high expectations and succeed as a result. It says in lessons, pupils engage enthusiastically with their work and are keen to do well. Teachers also plan learning activities carefully so that they match pupils’ needs closely. It adds that pupils’ thirst for learning is evident. Blackthorns joined the University of Brighton Academies Trust, sponsored by the University of Brighton, in 2015. The role of the Trust was commended in the report. It says: “Governance is very effective. The local board and wider trust work very well together to ensure legal duties are met. Dr John Smith, chief executive for University of Brighton Academies Trust, said: “I whole heartedly congratulate Blackthorns on this outstanding judgement.